At School with my Horse. To prove to everyone at school that I was a true princess, I, Nolwenn du Garrec, decided to ride my horse Cassiopee to school. Maybe not such a great idea after all ...! LDF Notes: The adventures of a horse-loving family. Very funny stories. Chapter book. 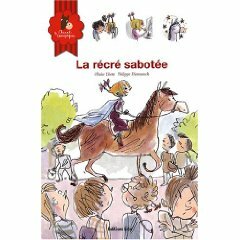 Notes LDF: Les aventures de la famille Garrec, éleveur de chevaux. Des histoires très amusantes ayant toutes pour thème les chevaux. Description: Soft cover - 32 pages - 8.5 x 5.5 in.